We offer an effective laser hair removal solution to permanently remove unwanted hair. Now with the Gold Standard system, we offer the Soprano XLi (virtually pain free) diode laser. 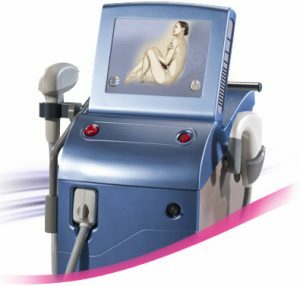 810nm Diode laser is the industry accepted most effective hair removal technology, especially designed to remove unwanted hair faster, with less discomfort and more reliably than any other method. Pain-Free, Hair-Free™ is for everyone. It’s safe for all skin types, hair types and most hair colours. It can even be used on tanned skin. The bottom line is – if you have hair where you wish you didn’t, Pain-Free, Hair-Free is for you. Pain-Free, Hair-Free™ uses the most successful photoepilation wavelength (810 nm), which makes it the gold standard for laser hair removal. In addition, a patented DualChill™ mechanism ensures the surface of your skin stays cool and even more comfortable throughout your treatment. Pain-Free, Hair-Free™ breaks the mould of previous laser hair removal systems. The system’s unique IN-Motion™ technology, along with the sweeping motion of the laser, safely and gently heats the targeted area under your skin while you stay comfortable. Pain-Free, Hair-Free works by using pulses of infrared diode laser energy to gradually heat the hair follicles in the sub-dermal layer of skin until they can no longer produce new hair. Using unique, IN-Motion™ technology and a patented DualChill™ treatment tip, the surface of your skin stays cool and comfortable. The sweeping motion also eliminates any skipped or missed spots common to other types of laser hair removal. There are a number of factors that can affect the success of a series of hair removal treatments, but generally, after each treatment, you’ll see a noticeable, permanent reduction in the number of hairs that regrow in the treatment area. Typically, it will require 6 – 8 treatments or more to permanently reduce the number of regrowing hairs by more than 80%, six months after the last treatment. Most people find Pain-Free, Hair-Free very comfortable. While pain tolerance is subjective, many patients often describe the sensation as soothing as a “hot stone massage.” If you find it otherwise, talk with your doctor or laser technician.